The Dec. 6 ballot will feature two runoffs with national implications. 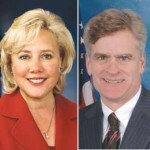 U.S. Sen. Mary Landrieu (D) will face Congressman Bill Cassidy (R) for a six-year term in the United States Senate. Conservative Republican candidate Col. Rob Maness received more than 200,000 votes in the Nov. 4 primary, and his endorsement is considered important to uniting conservatives behind Cassidy.On Nov. 4, Republicans picked up eight seats and won control of Senate, and a Republican win in Louisiana would strengthen the party’s hold on the body. other candidates in the Nov. 4 primary. Fifth place finisher Lenar Whitney (R) endorsed Graves Wednesday. It is unclear if candidates Paul Dietzel (R) and Dan Claitor (R) will make an endorsement.